Google’s Nexus devices gave Android fans the experience of a stock UI, at a time when manufacturers and carriers were forcing heavy custom skins and bloatware onto the devices they sold. The Nexus phones found their share of fans by striking a good balance between price and performance. With a loyal user base already in place, Google decided to try playing in the big leagues with the Pixel series last year. 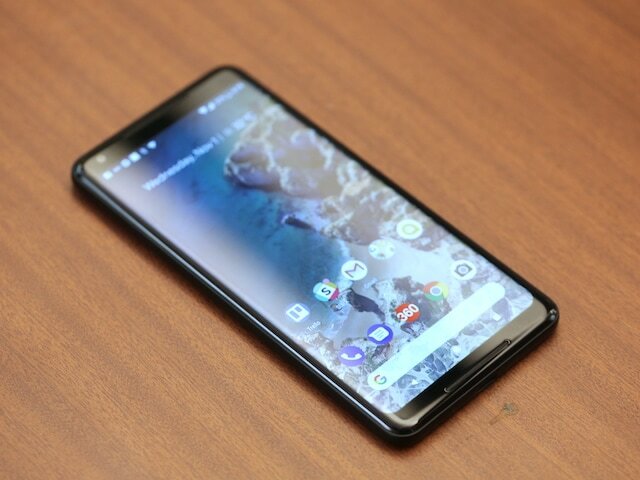 The philosophy of providing the best Android experience remained, but the emphasis was more on premium features and performance than affordability. Compromises that had been made previously were abandoned, and most notably, the original Pixel and Pixel XL had arguably the best cameras of their generation. This direction continues with the Pixel 2 and Pixel 2 XL, though Google is taking slightly different design approaches this time around, which makes for some interesting differences between the two. The Pixel 2 XL is what we have for review today, and it is the larger and prettier of the two. It is priced starting at a steep Rs. 73,000, which puts it right against the Apple iPhone 8 Plus (Review). Of course, it also competes with other flagships including Samsung’s Galaxy Note 8 (Review) and LG’s V30 (which is yet to launch in India). It’s also hard to ignore all the bad press this phone has received ever since it went on sale. We’re going to keep an open mind despite multiple reports of serious issues, and see how they actually affect our day-to-day usage. We have a lot to get through, and prospective buyers have a lot to think about before making any final decision. Let’s begin. The Pixel 2 XL looks great in the Just Black trim, but you can also get it in Black and White, which is a lot more attention-grabbing. Google has used an aluminium unibody chassis for the phone but there’s no way of telling when you hold it due to the coating applied. This has its pros and cons. The matte finish on the Just Black version doesn’t attract fingerprints and offers a good grip. Plus, it helps hides the antenna bands. On the flip side, we personally miss the premium feeling of exposed metal and glass. The coating seemed fairly resilient to scratches in the short time that we used the phone, so it will be interesting to see how it holds up after a few months of usage. The placement of the volume rocker is ergonomic as it lines up nicely against your thumb (if you’re right-handed), but the volume buttons are a bit of a stretch. The SIM tray is placed on the left side, and only accepts a single Nano-SIM. There’s no provision for a microSD card either, just like with earlier Pixel and Nexus devices. The USB Type-C (USB 3.1, Gen1) port is placed at the bottom, and is the only physical port. This new generation of Pixels has dropped the headphone socket, joining the long list of recent smartphones that have followed in Apple’s footsteps. 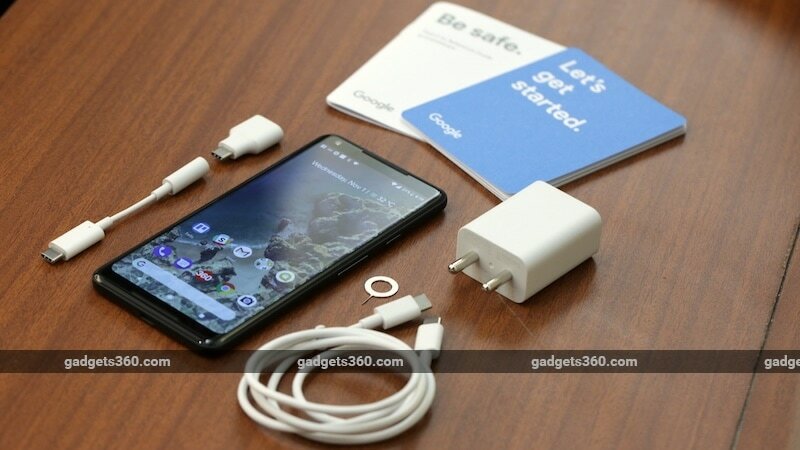 Google provides a Type-C to 3.5mm dongle in the box but no earphones of any kind – we would have liked a native Type-C headset, given the phone’s premium price tag. There are stereo speakers in the front – the earpiece doubles up as one speaker, and there’s another below the screen. We even have a notification LED in the upper right corner. We now get to the part which has everyone up in arms — the display. Google has used LG’s pOLED technology, and in fact the Pixel 2 XL is entirely manufactured by LG. LG has used Gorilla Glass 5 with subtle curved edges on all sides. However, if you look closely, the display itself doesn’t actually bend – there are sizeable black borders all around it to accomodate the curved glass. The 6-inch panel adheres to the 18:9 aspect ratio and boasts of a dense 1440×2880 pixel resolution. Coming to the issues that many users are facing, yes, we immediately noticed a blue tint when viewing anything on screen from an angle (more on that later), and the colours did appear dull (the reds and greens mostly). We haven’t encountered the highly publicised burn-in issue yet, so hopefully our review unit isn’t affected by that. Google has since responded to these issues and has said that a fix is coming via a software update. On paper, this screen promises 100 percent of the DCI-P3 colour space. The dual appearance of colours is caused due to the fact that the Pixel 2 XL’s display is calibrated to the sRGB colour gamut, which was done for “aesthetic” reasons. Honestly, other than being jarring at times, this is something we could see ourselves eventually growing accustomed to. After a couple of days, we hardly noticed the difference. Videos looked fine as long we weren’t doing a side-by-side comparison with another phone, especially one like the Samsung Galaxy Note 8 and the original Pixel which both have great screens. The upcoming fix will enable users to select a different colour profile, which should result in livelier colours. 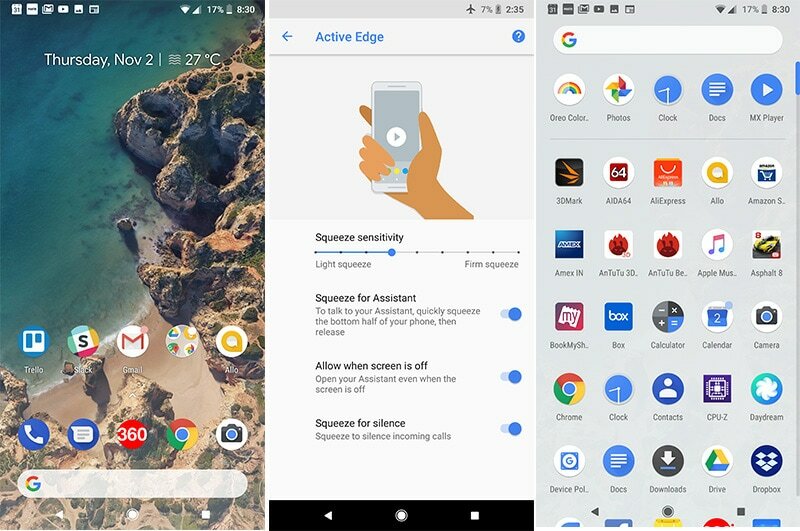 The burn-in issue is also being addressed as well, and while there is no fix for the physical nature of the screen, Google’s UI will auto-fade the navigation bar out when not in use so that it isn’t likely to burn in, colour match the bar to each apps’s colour scheme, and drop the screen’s brightness down by 50nits. Meanwhile, there is a temporary fix out there till Google gets its act together. However, there doesn’t seem to be any solution to the blue tint issue, as according to Google, that’s “inherent in the display hardware”. Although Google says the blue tint is only visible at sharp angles, this simply is not the case. More than the dull colours, this is constantly annoying, especially if you have Night Light turned on. Tilting the phone even slightly in any direction causes one half of the display to turn blue while the other half stays amber. We don’t think Google deserves a free pass here, even with all the lengthy explanations it has come up with. No matter which way you look at it, the display on the Pixel 2 XL simply isn’t as good as those on other flagships. Around the back, the glass patch is shorter so it doesn’t cover the fingerprint sensor like on the older model. The circular fingerprint sensor is smaller this time as well, but is just as fast at authentication. You can also use it to pull down the notification shade with a swipe down. The Pixel 2 XL has pressure sensors on its lower sides which when squeezed, trigger Google Assitant. 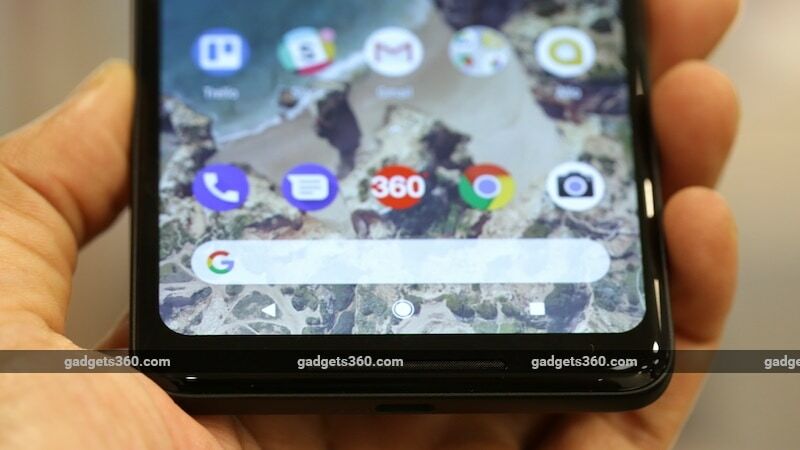 Google calls this ActiveEdge, and it’s similar to the feature that HTC introduced with the HTC U11 (Review). As of now, it can only be used to call up Assistant and silence incoming calls. You can vary the intensity of of the pressure that’s needed so you don’t accidentally trigger it when holding the phone or taking it out of you pocket. In the box, you get a fast-charge capable adapter, USB Type-C to Type-C data cable, Quick Switch adapter, USB Type-C to 3.5mm adapter, SIM eject tool, warranty leaflet, and quick start guide. The quality of the accessories is very good, and they feel long-lasting. Google has gone with Qualcomm’s best current SoC, which is the Snapdragon 835. This is an octa-core chip which we’ve seen in the OnePlus 5, Sony Xperia XZ Premium, Nokia 8, Sony Xperia XZ 1, and Mi Mix 2. Along with it, you also get 4GB of RAM and 64GB or 128GB of storage. Other specifications include 4G with VoLTE, dual-band WI-Fi ac, Bluetooth 5.0, NFC, and connectivity to four satellite systems (GPS, GLONASS, BeiDou and Galileo) for location data. Sensors include a barometer, hall sensor, gyroscope, compass, and the usual accelerometer and ambient light sensor. The Pixel 2 XL is IP67 certified for dust and water resistance, so it can survive being dunked underwater. Sadly, the phone misses out on some flagship-level features such as wireless charging and an HDR display. The Pixel 2 XL (and the Pixel 2) debut Google’s first in-house processor (with help from Intel) called Visual Core, which is a dedicated image processor. It’s inert right now and will be activated after these phones receive the upcoming Android 8.1 update. The main purpose of Visual Core is to allow third-party apps to take advantage of HDR+ image capturing and processing, which is currently only available in the Pixel camera app. Google’s strength has always been in software and the Pixel 2 XL is the company’s new vessel to showcase this. It runs vanilla Android 8.0 out-of-the-box but there are a few new additions to the homescreen, lockscreen, and launcher. Thanks to the pOLED panel, the Pixel 2 XL has an always-on display feature, which shows you the time, date and unread notifications. However, you can’t interact with notifications on the lock screen like you can on Samsung’s current phones. There’s also a Now Playing feature, which automatically recognises a song playing in the background and will show you its title and the artist at the bottom of the screen. 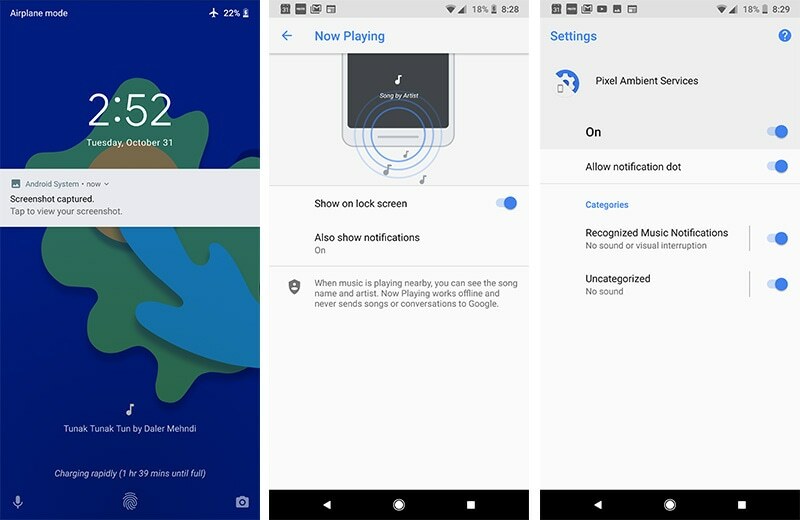 This doesn’t need an active Internet connection as the Pixel 2 XL has a database of song footprints stored locally, which varies by region and is updated on a weekly basis. We tried it with popular English and Hindi tracks and it worked well for the most part, though it couldn’t recognise some newer Bollywood tracks and failed where there was too much background chatter. Overall, it seems like a nice feature to have but is no replacement for dedicated apps like Shazam or SoundHound especially when dealing with not-so-popular tracks. There’s also a new ‘At-a-Glance’ area at the top of the home screen, which gives you the time, weather and other details such as upcoming appointments from your calendar. This cannot be removed from the homescreen. So far, only information from your Google Calendar app and traffic updates are being shown, but Google will be linking this to more apps in the coming months. The quick search bar has been moved to the bottom, where it’s closer to your thumbs. It stays put as you swipe across homescreens, and cannot be removed either. We covered the main features of Oreo when it launched, and you can read all about them here. 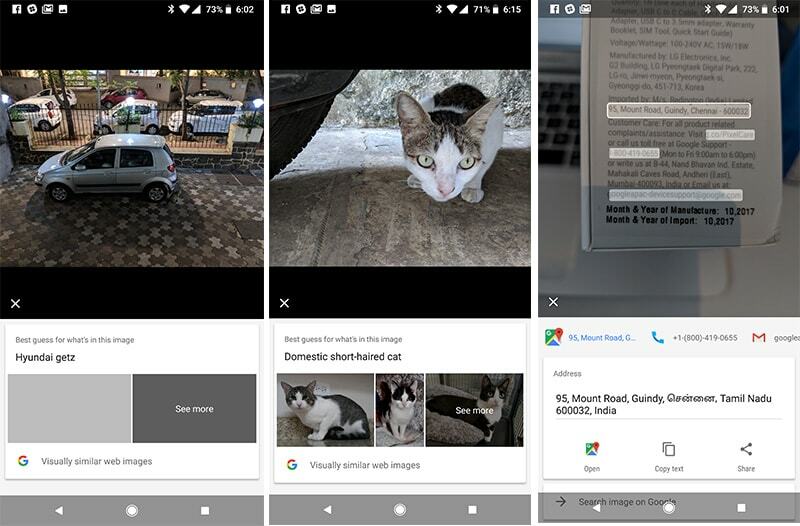 Google Assistant works as expected, and swiping right takes you to the Google Now screen with relevant news shown to you in the form of cards. Bundled apps include Google’s usual suite, plus Allo and Duo. The interface is slick and speedy but it can feel a bit bit too barebones sometimes. For instance, something as basic as being able to annotate a screenshot once you take it, isn’t supported. The Settings app has changed quite a bit, and now, similar functions are grouped together. Some options are also hidden from view, so as to give the app a simpler look. Gestures that are supported include a double-press of the power button to launch the camera app, and a double-flick of the wrist from within the camera app to switch between the front and back cameras. There are also new live wallpapers called Living Universe, which look really cool. 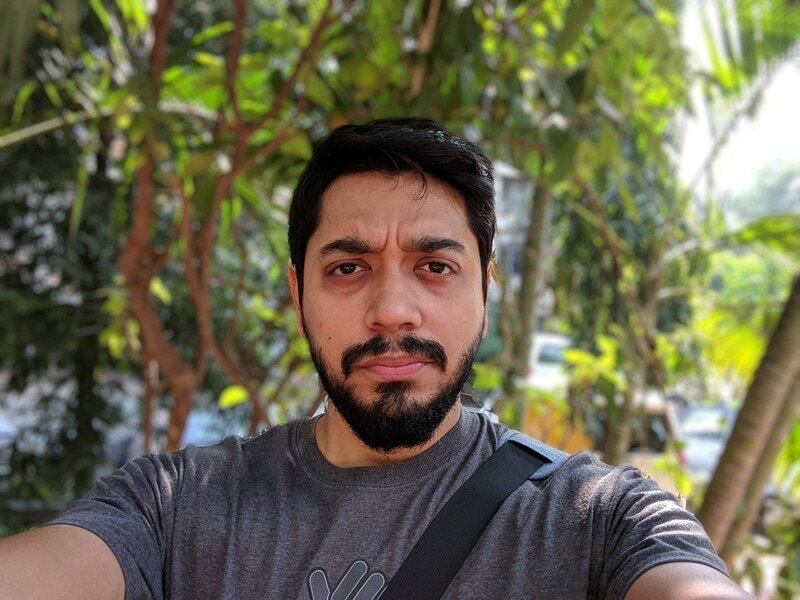 The Pixel 2 XL is privy to an early beta of Google Lens, a new feature that uses machine learning to recognise objects, street address, phone number, etc, from the photos you’ve taken and gives you more information about them. 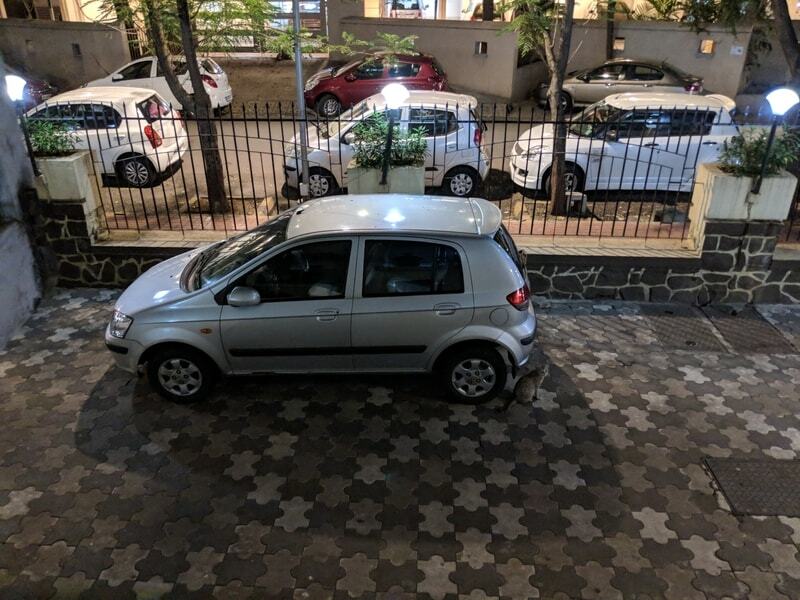 Currently, this feature can be found in the Photos app in the Pixel 2 and Pixel 2 XL but it will be added to the camera app and to Assistant in the coming months. For a beta product, it works decently well. When you’re browsing through your photos, you’ll notice the Lens icon just before the delete icon. Tapping it will bring up a little window in which Lens will show its best guesses of what’s in the picture. In our experience, it works well with addresses and phone numbers (provided that they’re in focus). Lens correctly identifies the details and offers you options to navigate to the place or call the number directly, which is very convenient. It even managed to recognise the species of some flowers we shot, a type of cat, and the model of a car based only on its profile. There were times when it failed to recognise objects or just gave generic descriptions of them. Its true potential will be realised once Lens comes to the camera, where you’ll be able to see additional information about objects in front of you, in realtime. Like the previous Pixel smartphones, performance is blazing fast. There’s pretty much zero lag when multitasking or running heavy apps. Games run smoothly and the phone doesn’t get too hot even after long gaming sessions. We tested Asphalt 8: Airborne and GTA: Vice City, which ran flawlessly. The display’s touch response is also superb and although it attracts smudges, they come off easily. The screen doesn’t get very bright, but we didn’t have trouble using it outdoors under bright sunlight. Call quality is very good and the earpiece is loud enough even in noisy environments. The Pixel 2 XL works well as a speakerphone too. We didn’t seem to have any audio issues with our unit, as many others have reported. The dialler app now has Google Duo integration, and you’ll see a video icon next to each person’s name. Tapping that will directly place a video call to them via Google Duo. Soon, you’ll also be able to switch from a voice call to a video call, mid-way. The 18:9 display is sharp, and everything looks smooth. The stereo speakers do a good job her at separating sound but the volume level varies from app to app. For instance, we really needed to max out the volume when watching Netflix shows even in a relatively quiet room, but music streamed through Apple Music was quite loud. We didn’t hear any distortion at high volumes and even though there’s no serious bass, the sound is warm without resorting the tinny signature that most smartphone speakers tend to have. 4K videos play smoothly, and you can now use picture-in-picture mode with YouTube videos. We recommended the first Pixels to a lot of people, purely based on camera quality, and the Pixel 2 XL is no different. 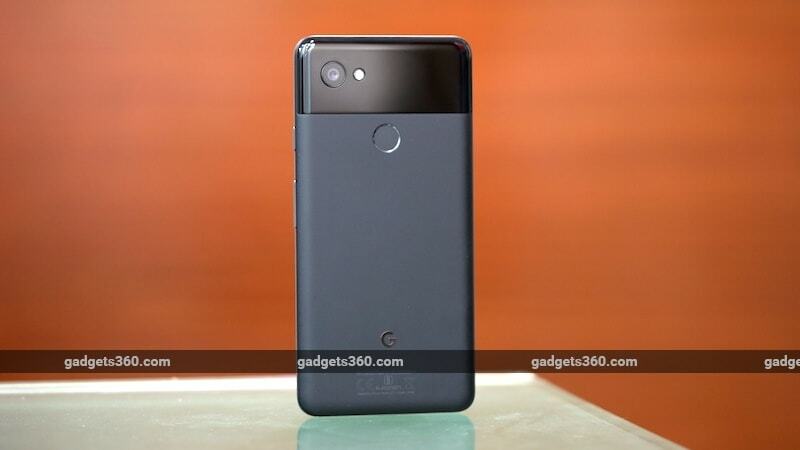 The Pixel 2 and Pixel 2 XL have exactly the same camera configuration, which is a single 12.2-megapixel sensor at the back and an 8-megapixel, fixed-focus sensor in the front. The rear camera gets an upgraded f/1.8 aperture and optical stabilisation (along with electronic stabilisation), which are big improvements over last year’s phones. The rear camera also gets laser and dual-pixel autofocus. Focusing is extremely quick under good lighting, and we almost never had to tap to focus. There’s also barely any shutter lag, and photos are saved almost instantaneously, even with HDR+ enabled. Speaking of HDR+, it’s enabled by default. You can go into the settings to either switch it off or activate an “HDR+ enhanced” mode instead, which adds a bit of lag to photo processing. Honestly, we couldn’t find any major difference between the two modes. Perhaps with the Pixel 2 XL’s Visual Core enabled, we might see even better (and faster) results in the future. The quality of photos taken during the day is pretty excellent. More than the upgraded hardware compared to the first Pixel, it’s Google’s software magic that really helps in achieving stunning pictures. Details are very good and colour accuracy is spot on most of the time. Pictures have a neutral colour tone this time around, compared to the first Pixel which veered towards the cooler side. Low-light performance is very good too and although focusing speeds dip a little, it’s still quick. Noise is handled well, although there is visible noise in landscapes taken in very low light. On the other hand, you get good dynamic range. The big new addition to the Pixel 2 XL’s camera app is a Portrait mode. It works just like it would on any dual-camera smartphone, only here, it uses the dual pixels in the same sensor to gauge the depth behind a subject. Unfortunately, you can’t see a preview of the blur effect on screen when you’re taking the shot, and you can’t adjust the intensity afterwards either. It takes about a second or two for the effect to be applied, so there’s a bit of lag when you try to check photos you’ve just taken. In terms of the quality of the effect, Google’s software and machine learning chops really shine here. The Pixel 2 XL gets it right pretty much every single time, even in low light where most dual camera setups struggle or refuse to work. 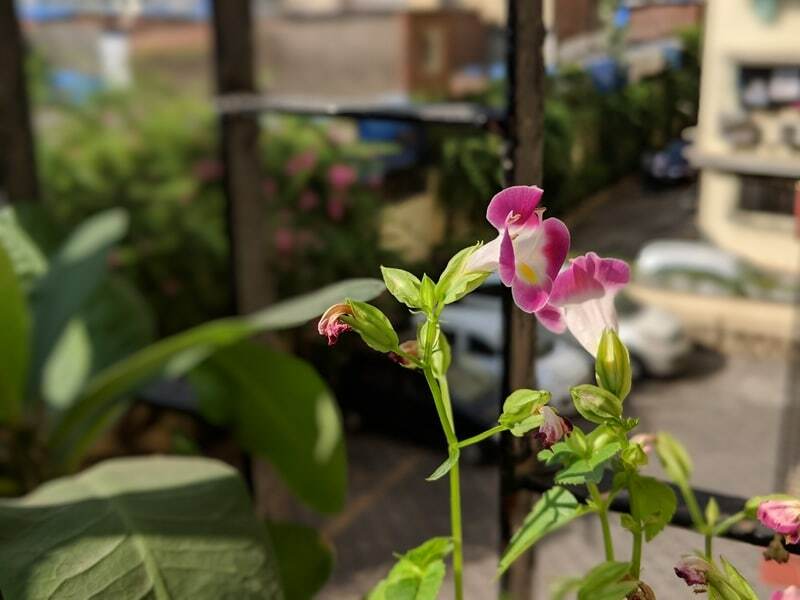 There are minor flaws in the blurring process at times, but that holds true for pretty much all smartphones with dedicated depth cameras as well. Since this is all software-based, Portrait mode works even with the front 8-megapixel camera. Details are very good in low light, and skin tones are represented well. Video is another area which has improved. Thanks to the combination of optical and electronic stabilisation, the ‘shimmering’ effect in video when you’re moving is eliminated. Stabilisation works very well in low light, but video can get a bit noisy. There have been reports of users having audio issues when recording video, but we didn’t experience any problems. In fact, we’d say the microphones are a bit too sensitive, so if you’re planning on vlogging the you might want to keep a good distance between you and the camera so that your voice isn’t too sharp. Recording modes include 1080p at 120fps/60fps/30fps; 720p at up to 240fps; and 4K at 30fps. Video quality is very good in daylight, with strong details and colours. Slow-motion video is also good. We wish the Pixel 2 supported 4K at 60fps, as this seems to be the next big video feature and is already supported by the iPhone 8 Plus and iPhone X. This brings us to the camera app. It’s possibly once of the easiest apps to use, which is great for novices, but a bit too constrained for power users. There’s no manual or professional mode here, which we’ve seen in all flagship Android phones for years now. The only level of manual control you get is the ability to lock the exposure and focus, and adjust the exposure and white balance. There’s no option for recording RAW files or adjusting the shutter speed, ISO, etc. You do get Motion Photos, which means that the camera captures a few seconds of video along with a still. Other shooting modes include Panorama, Photosphere, Portrait, Slow Motion, and Burst modes. One advantage of having a large phone is you get a big battery. The 3520mAh battery lasted us well over a full day on a single charge, which is very good. Heavy use of the camera does make a sizeable dent in the battery life. Our HD video loop test didn’t have a very impressive runtime as we managed to get just 12 hours and 43 minutes. However, we feel that this could be down to the pOLED panel and the QHD+ resolution. Fast charging works wonderfully on the Pixel 2 XL. We recorded a 66 percent charge in half an hour, and 90 percent in about an hour, from an empty tank. The bundled adapter has similar output specifications as Qualcomm Quick Charge 3.0-certified power adapters, however, fast charging didn’t seem to work the we tried a third-party charger. Google struggled with hardware with its Nexus devices, but it is trying to change that with big strategic investments, in the hopes that it can one day go toe-to-toe with Apple and Samsung. With all the learnings from its first two Pixel generations, perhaps the Pixel 3 might be the perfect Android device everyone hopes for (you know, third time’s the charm). But that’s in the future, and today we are dealing with a phone that costs Rs. 73,000 and has seen more issues within a few weeks of its release than most phones see in their entire lifecycles. Granted, many of these issues can be fixed with software patches, and we’re sure Google is working on them around the clock, but the experience needs to be at a certain level right from the beginning. The display is definitely sub-standard – there’s no two ways about that. The dull colours should be fixed soon, but the blue tint might annoy you constantly – it sure did with us. If you find that you can’t live without punchy colours, then we recommend choosing the iPhone X, iPhone, 8 Plus or Samsung Galaxy Note 8 instead. Now, on to the good stuff. As far as large-screen phones go, the Pixel 2 XL is one of the better ones we’ve lived with, mostly due to its ergonomic design. It isn’t as eye-catching as some other flagships, but the understated look will have its own share of takers. The no-frills Android experience might be a bit too bland for some, but you’re guaranteed timely software updates and security patches, which Android OEMs don’t always prioritise. Then there’s the camera, which is capable of some pretty incredible feats even with its single lens. 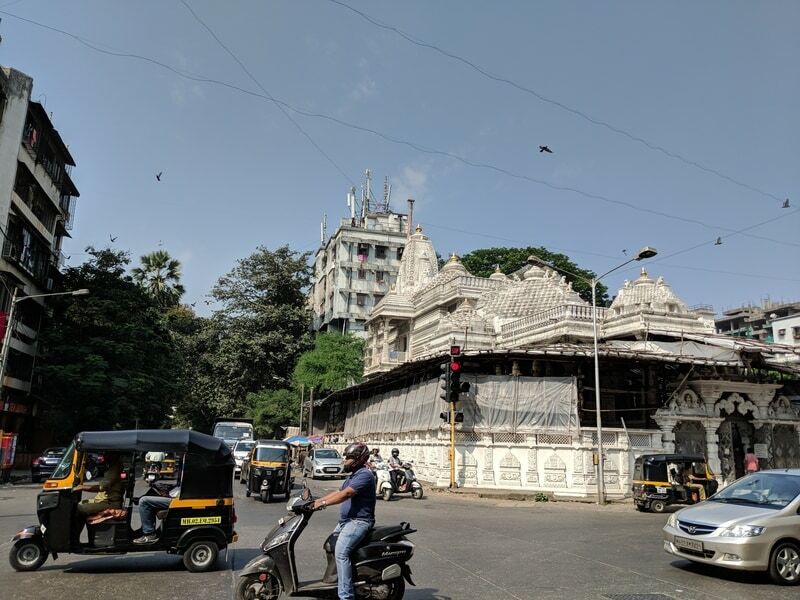 The Pixel 2 XL feels overpriced in India when you consider that it retails for $849 in the US (roughly Rs. 55,200). In the wake of all these issues that have cropped up, Google is now offering a two-year warranty for both its Pixel 2 devices, which is applicable here. However, this isn’t an international warranty, as Google confirmed with us, and is still limited to the country in which the phone is purchased. If you don’t want to take a chance with the Pixel 2 XL (and we don’t blame you), the Pixel 2 could be a better choice. It has had fewer problem reports than its bigger brother and you lose the 18:9 display, but it’s also less expensive while still offering the same great cameras, hardware and software as the XL. Stay tuned for our review of the Pixel 2.